Corn chowder just got a little bit easier with your handy Instant Pot. My Ultimate Instant Pot Loaded Corn Chowder will rock your world. 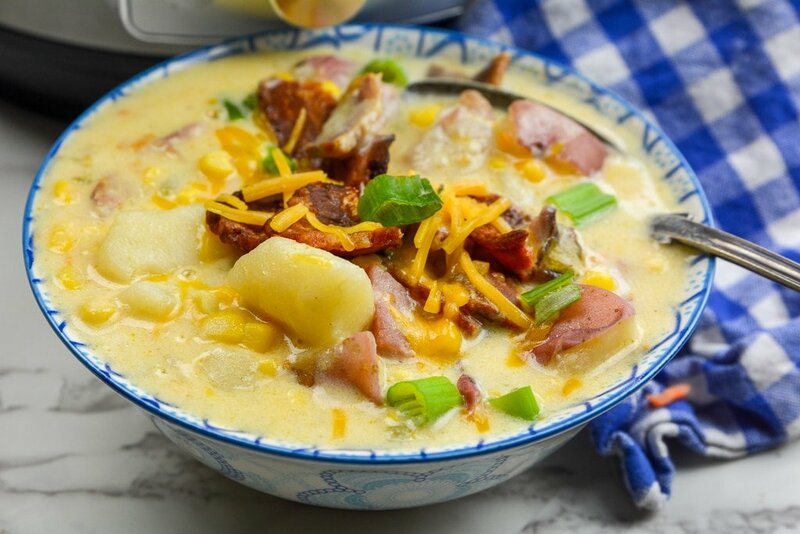 Loaded with hearty potatoes, ham, celery, onion, seasonings and of course tender and juicy corn all in a creamy base. A one pot meal that is perfect for your busy weekdays. One Pot Easy Instant Pot meals like my Instant Pot Chicken Pot Pie Casserole is one of my favorite dishes. One thing I have never tried in my life is Corn Chowder it’s funny because I love corn. I wanted to make a soup yesterday something new to bring to all of you but I could not decide. Someone suggested Corn Chowder I wanted to give it a shot. Let me tell you this is more like a full meal just like my Italian Wedding Soup and Panera’s chicken and wild rice soup. 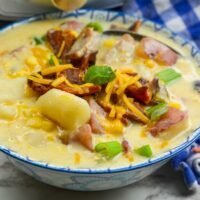 The Instant Pot gives my loaded corn chowder recipe that low and slow-simmered taste, but in a fraction of the time. I love that I can easily make dinner that tastes as you ordered at your favorite restaurant, in a hurry. 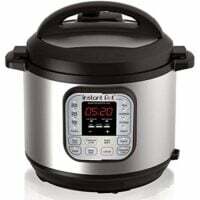 My Instant Pot and Ninja Foodi both are appliances that have really allowed me to spend less time in the kitchen without sacrificing flavor. We are meat eaters in our home, so I added in ham to really make it feel like a hearty and comforting bowl of soup that is a complete meal. You could also pair with a side salad, half a sandwich or dinner rolls if you were looking for something more. For my loaded corn chowder, I really went all out in the flavor department. I wanted layers of flavors so I reached for onion, celery, carrots, corn, ham steak, chicken broth, bacon, and a handful of seasonings. It all works together so well, it makes the best corn chowder. My recipe is meant to be a thicker base that is creamy. If you find that your soup could be a bit thicker, reach for some cornstarch. Just make sure the soup is nice and hot, and mix 2 tablespoons of cornstarch with a little cold water. Pour into your chowder and store. The starch will thicken without compromising flavor. Since you are using some creamier items like sour cream, chicken broth, milk, etc, it does add in some added calories. There are ways to lighten up the soup but you won’t get that creamy texture that you are going to be hoping for. Yes! You are not boxed into the Instant Pot. Pre-cook your bacon in a skillet and add all your items into the slow cooker and let it cook for 6-8 hours. If it isn’t thick about an hour before serving do the corn starch and water tip above to help thicken it up. You can leave the sour cream out and add in around 30 minutes before you serve to help prevent it from curdling. 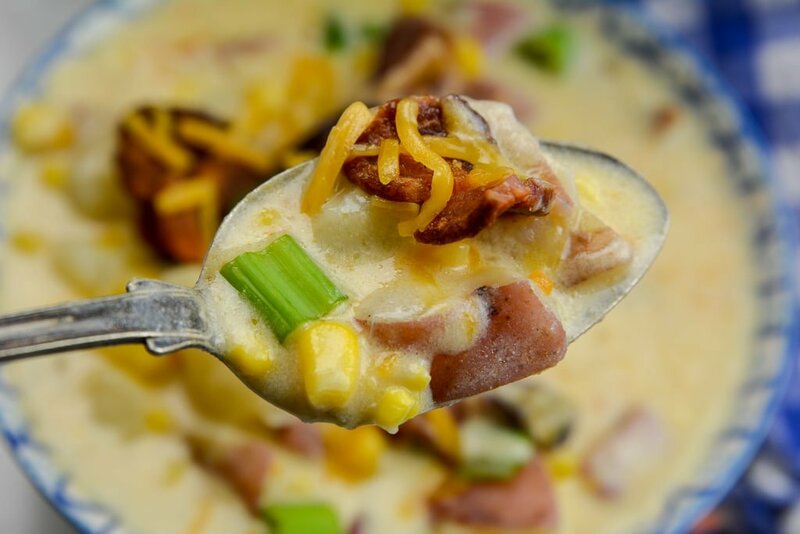 You can freeze the loaded corn chowder. I will say from the sour cream it will adjust the texture once you reheat the soup, but it is still just as flavorful. Allow your soup to cool and then place in a freezer in a freezer bag or airtight container. You can safely freeze your corn chowder for 1-3 months. To reheat just thaw in the fridge the night before, and warm up in Instant Pot or stove top. Of course! If you prefer adding pre-cooked chicken, just swap the ham for chicken. You will get a slight difference in flavor but it pairs nicely together. 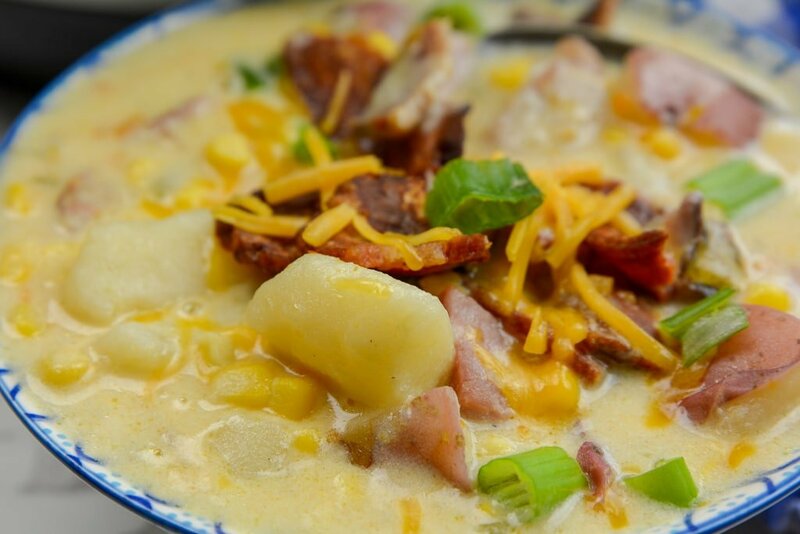 Whip up this comforting loaded corn chowder this week. The weather is in full winter mode here, and a nice and comforting bowl of soup can really warm the bones after being out in cold for the day. The Ultimate Corn Chowder is one of the easiest Instant Pot Soups you can make. Creamy, Hearty, and Full of Flavor. This Instant Pot Soup Is More like a one pot meal. Add onions, celery, and carrots, let saute for about 2-3 minutes until onions are translucent. Add potatoes, ham, frozen corn, and chicken broth. Set Instant pot to Manual, High Pressure for 15 minutes. Stir in Milk and make a slurry cornstarch and broth. When your soup gets bubbly and thick stir in cheese and sour cream. I made this tonight for dinner. So, so delicious! Thank you for this delicious soup recipe! My husband’s last words to me before falling asleep last night, “Thank you for making that soup for supper”. Such a romantic guy!